The Canadian winters can be harsh and brutal, with temperatures and wind chills well below freezing. On these particularly chilly days, you garage door can have problems of its own. It can open and close much more slowing if it is an automatic door. The cold causes the parts and components to contract and potentially seize up. Not to mention if there was snow on the ground near the garage door that happened to melt a little during the day, where water got under the bottom seal of the door, it could freeze overnight, causing the door to stick to the ground. If you hit the switch to open you garage door and the motor kicks in but nothing happens, you want to shut off the electric opener right away. You will need to manually unstick the frozen door. The first thing you will want to do is check outside and make sure snow has not piled up against the door. If it has clear it away. Once the snow is cleared away, attempt to open the door manually. You will need to dis-engage the door from the automatic track, by pulling the manual release cord. If the door starts to move slightly, then stops, it means it is frozen to the ground. You can use a hair dryer to heat up the bottom, just take care to not place it too close or get it in water. If the door is not frozen to the bottom and won’t open manually, certain parts and components could have seized up or contracted too much. You can use an electric heater and warm the garage up above freezing to see if this helps. If the door opens after warming up the garage, then great. If it still won’t budge, now is the time to call in a professional garage door technician for assistance. Dealing with a frozen garage door is not something you will want to have to deal with day in and day out every cold winter day. While we cannot guarantee your garage door will not freeze shut, we can offer some preventive tips so it will hopefully not happen to you. 1. Replace your existing door with an insulated garage door. Insulated doors help block out cold and could prevent freezing. 2. 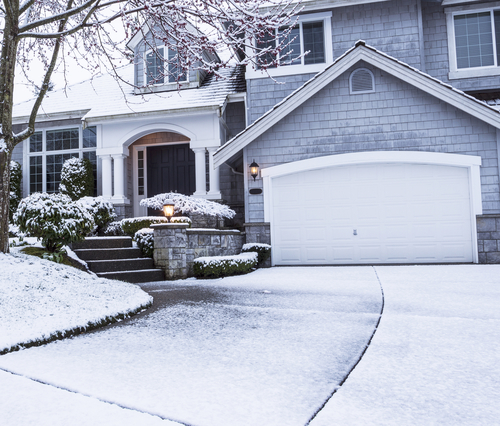 Before closing the door, make sure to spread deicer pellets under where the door will close. The deicer pellets will water under the door from refreezing. 3. Install a new weather seal around the garage door opening. If you notice cold air gaps or light coming into the garage when the door is shut, you need a new weather seal. 4. Make sure all moving parts and components are well-lubricated. Lubricants contain oils that do not freeze and can prevent any moisture on parts, components or the door’s track from also freezing. For more information about replacement garage doors, including insulated ones, or help finding a garage door technician in your area, please feel free to contact Richard-Wilcox Doors at (800) 667-1572 today!